Spiral staircase design can be challenging with some stair companies. But with Southern Staircase, we make it easy for you! With an award winning team of Architects and builders, combined with the latest industrial technology, our team can design, build, deliver, AND install any spiral staircase, anywhere- nationwide. But why keep our methods a secret? We offer this spiral staircase design guide to give you the customer insights into how we design the most sought after spiral stairs in the region. Will the staircase be outside or inside? The location of the spiral staircase can have an overall effect on selecting the best material. For example, metal staircases and wood staircases react differently in an ever-changing climate or temperature. Traditional, contemporary, or a modern spiral staircase? There are many designs you can choose from, but the type of spiral staircase design should reflect the overall home or building space design as well. The great thing about spiral staircases is that they are already known as space-savers! The width of the step, as well as the height between each step can be fully customized to your taste, preference, and space. Spiral staircase designs can be simple or complex in nature. Every aspect of a spiral staircase can be custom-designed to you. If you’re unsure of what type of look you’re going for, call us! Our design team specializes in tips that can help you not only get the most functionality from your staircase, but also aesthetic appeal! We help you throughout the entire process, making every step that much easier for you. 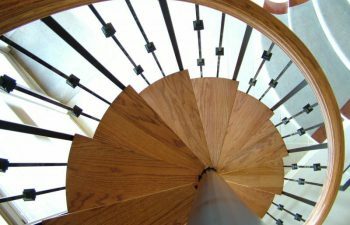 We hope this spiral stair design guide has helped you better understand all the care and craftmanship that goes into a Southern stair! Click here to view our spiral staircase photo gallery for more ideas.